This roasted red pepper cheddar can be prepared in two ways: as a firm shreddable cheese or as a melty sauce. 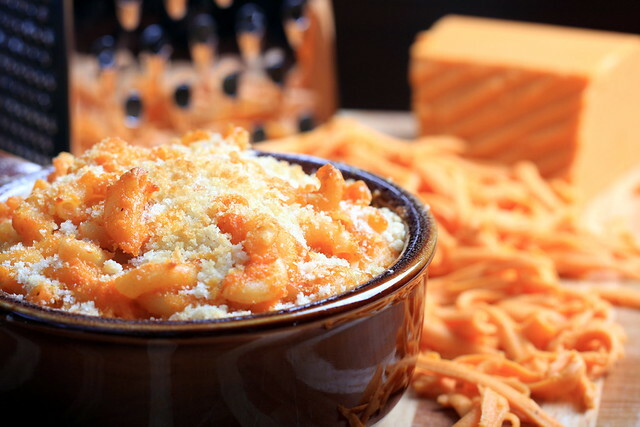 Either way, it creates a rich, cheese-like base to drench pasta in, and makes an addictive mac and cheese. This recipe is similar to this deep-fried version I made a few months ago, except I threw in a roasted red pepper for flavor and color, and then baked it. The end result was a crispy-topped mac and cheese, with a rich and gooey center, making it a perfect comfort food dish for fall. Combine the coconut milk, vinegar, salt, agar powder and pepper in a small saucepan over medium heat. Whisk briskly until it comes to a small boil, and continue to whisk for a minute or two more. Remove from the heat, then whisk in the tapioca/water mixture and nutritional yeast. Throw in the roasted red pepper and combine it by either using an immersion blender or quickly transferring to a blender to puree. Pour the contents into a glass pyrex, cover, then allow to set in the refrigerator overnight. Preheat your oven to 400 degrees. Bring a medium-sized pot of water to a boil, add in the dry macaroni and cook per the package instructions. Reduce the heat to low, then drain the pasta well and return it to the pot. Then, using a cheese grater, grate as much of the cheese as you want over the top. Stir well to combine. Add a little almond or rice milk to moisten. Bake for 15 minutes in a heat-resistant vessel. Add some panko breadcrumbs to the top and bake for 5-10 minutes more, or until the panko is slightly golden brown. Serve immediately. Follow the instructions in the first paragraph above, but reduce the agar amount from 2 tsp to 1/2 tsp and omit the addition of almond or rice milk. Pour the cheddar on top of cooked macaroni and bake at 400 per the instructions in the second paragraph above. your homemade cheeses are amazing! i definitely have to make them. and the mac and cheese looks fantastic! and soooo creamy. This looks soooooooo good, I really, really must try it:) I haven't seen coconut vinegar around, but it must be possible to get it somewhere – when I was a girl macaroni cheese was a favourite meal – real, wheat macaroni, and real, dairy cheese, because I didn't know any different! I simply MUST get my hands on some coconut vinegar and get to work trying out some of your awesome creations. They are just so amazing. I love the idea of a vegan cheeze that is not 100% nooch. And the little grated bits look perfect! I love blending roasted red pepper into anything–such a surefire way to add color and flavor. And I'm so impressed by your homemade cheeses! I've had my eye on that coconut milk cheese for ages. WOW! Your cheese looks amazing! Where would one get coconut vinegar? I don't think I've ever heard of that. Thanks! I found coconut vinegar at Whole Foods, around where they keep the balsamic vinegar/oils. I'm so intrigued by this! I can't believe there's no dairy in it. I have everything on hand but the agar and tapicoa powders. Looks like they're going on my shopping list! I can't believe this isn't cheese! That's so cool! And with the combination of coconut milk and red pepper I'm sure it tastes delicious. Homemade cheddar, interesting. Definitely going to have to try! I knew there was a reason I bought coconut vinegar! 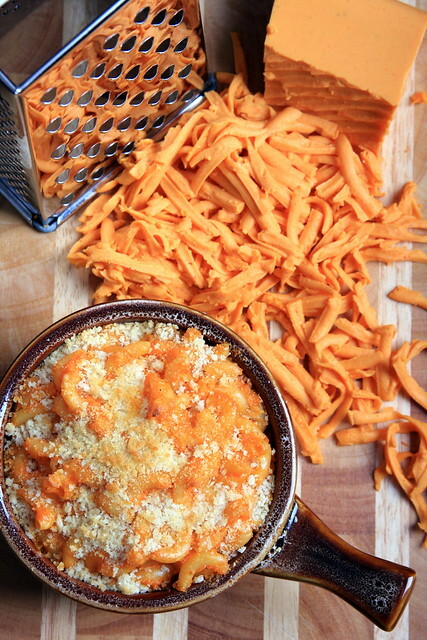 My god do I ever love mac n cheese, this looks incredible. I really need to start experimenting with vegan cheeses. I really want to try that cheese… it looks incredible. Is coconut vinegar essential or could I use apple cider vinegar? Thanks Babette! I've heard mixed reviews on using ACV for this cheese. Some have said it is perfect, others have said it affected the texture and the taste wasn't good. I've personally never used ACV in making this cheese. If you can find coconut vinegar, I would recommend using it! Oh my God, this is absolutely delicious. A definite keeper. I made it last night with a few changes… I only had about a fifth of a coconut milk can, so I used that and added soy creamer to have the same quantity… I know coconut milk sort of hardens in the fridge, so I put slightly more agar and tapioca. I used apple cider vinegar too and added a tiny bit of white miso. It is a little fragile, but I still managed to grate it. I had a grilled cheese sandwich for lunch today and it was perfect… it was more liquid than cheesy, but amazing nonetheless. I'd like to experiment with more tapioca. Babette, thanks for trying it out and for your feedback — so glad you liked it! I love this method for making cheese because you can play around with the ratios like this and get something slightly different each time. I hope you enjoy lots of cheesy goodness! I just melted some over caulipots and it's so good! The only issue I have is that's it's too addictive. Ohmuhgawsh, ohmuhgawsh, oh muh gawsh! That cheese looks insane! (in a great way, obviously) And your mac and cheese? Holy crud. It's beautiful. Great job, Erin! Can you taste the coconut from the coconut milk? I'm fine with coconut in my dessert but I'm curious how it works in something more savory like mac n cheese? It looks amazing! Not really. When you combine it with the vinegar, it transforms the coconut taste into a cheesy taste. Oh my god, this looks insane! I wish I was feeling a little less lazy right now! Thank you for sharing this recipe!! I'll let you know if I try it!! I also appreciate your tip in the comments about how coconut + vinegar magically erases the coconut flavor in place of cheezy flavor. Brilliant. I tried making the cheese, but it didn't get hard enough to grate even after being in the fridge for 12 hours. Any ideas about what I did wrong? Hmmmm … the only think I can think of is: did you allow the mixture to come to a boil after adding in the agar? Agar needss to be brought to a boil in order to activate it. However, non-solid cheese will still work okay in a mac and cheese or grilled cheese sandwich! Maybe I didn't let it boil long enough. I still made mac and cheese with it though. It was AMAZING!! Thanks! Wow, this looks fantastic! I just found your blog through another vegan blogger that linked both of our cheese recipes in her post. I've been experimenting a lot with vegan cheeses and can't figure out how 2 t. is enough agar to firm your batch up. I've had to use 2 T. for firmness in a similar sized batch, can I ask you what brand of agar you are using. Maybe yours is super powered and mine is lame….Sometimes I use pectin instead of agar in cheez, I think it melts better. I've never used pectin before, but perhaps I'll give it a shot in my next batch! thx! I buy "Now" brand. Hmmm, maybe I'm just doing something wrong or maybe I need to see if I can find the "telephone" brand one somewhere on the internet. FYI, you forgot to list the nutritional yeast in the directions. I assumed that it went with the cheese mix that sits overnight. Also, I added some miso to give it a little more depth and it was very good. Thanks for trying the recipe out, Jeff! I reread the directions and realized I referred to that ingredient as "nooch" not nutritional yeast, so I adjusted the directions accordingly. I'm glad that you enjoyed it! Will this taste okay without the nooch, or have you tried it? My daughter has eczema and something in pasta has been making her itchy, either the wheat or yeast. So I am trying to avoid both but she loves cheese (can't have milk). This will taste just fine without the nooch, as there are plenty of other cheesy flavors already in there. I hope that this turns out to be a good alternative for your daughter! Hey, this sounds soooo good! How many ml is One can of full-fat coconut milk? Thanks Gloeckchenxvx — I hope you enjoy it! One can of coconut milk equals 403 ml. Just discovered your blog thanks to VegNews and gotta say, all the photos are insanely STUNNING! and all the recipes I've looked at thus far look incredible. It's such a joy to discover a new vegan food blog! I tried this tonight and it was a hit for both me and my dairy-eating husband. He claims it could pass at any potluck. I made a few adjustments to the sauce- I added turmeric, onion powder, garlic powder, paprika, white miso, and lemon juice (all in small amounts but helped it round out the flavors). I also doubled the vinegar and nooch as, initially, it still had that lingering coconut taste. Originally, I set it in the fridge for about 4 hours and it set well and shredded great! When it came time to make the mac and cheese, I ended up re-melting the cheese separately with some Earth Balance to make it a sauce again, tossed it with the noodles, shredded about 2 tablespoons of the cheese on top, and popped it in the oven! It was the easiest and best-tasting vegan mac and cheese I have made (and I’ve trialed a LOT of recipes). Thanks so much!!! I’ve made the shredded version and the quick version and I have to say that both are fantastic and easy. I find that adding a little more of the coconut vinegar, salt, and a little white miso helps give it that cheddar kick. Thank you so much for sharing this recipe!